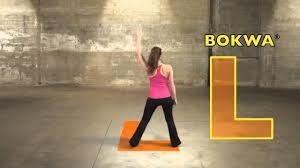 Bokwa was developed in Los Angeles by fitness instructor Paul Mavi. It combines flexibility and endurance through boxing movements and African dance. BO stands for boxing and KWA for Kwaito, a traditional dance and a South African music genre from the (19) 90s. Bokwa is a group training on music, in which the participants on contemporary music step on the floor in the form of letters and numbers. So, you play with your feet on the floor: numbers and letters. The advantage of the steps in the shape of an L, 3, J, K, and other combinations is that everyone can participate easily and quickly. So there is no choreography to learn. And there is no counting required and typically no rhythm or system of 8-count as with most fitness programs and dance figures.